The American Library Association made a creditable effort in 1976 to celebrate "the big one", its 100th anniversary. The highlight was its Centennial Conference which took place in Chicago (July 17-July23). Over 12,000 attendees (I was one of them) participated in a variety of centennial celebration activities including a "Fair-in-the-Park" on Wednesday evening in Grant Park. The fair featured balloons, clowns, a fife and drum corps, a JMRT kissing booth, a replica of the Liberty Bell, a reenactment of the "Jewett-Cutter Mud Catalog Controversy" (a topic for a future post? ), and other historical spoofs. Three of five lectures in a centennial series by prominent scholars titled "Libraries and the Life of the Mind in America" were given at the conference. During ALA's centennial year American Libraries did a commendable job of publishing articles related to ALA's history including a series of "ALA Centennial Vignettes". Library historians gathered in Philadelphia on October 3-6, 1976, 100 years after ALA's founding meeting in the same city on October 4-6, 1876, for Library History Seminar V. Presentations at the seminar resulted in the publication of Milestones to the Present edited by Harold Goldstein (Gaylord Professional Publications, 1978). A major membership drive in 1976 with prizes for recruitment was kicked off with the theme "Come join us for our second century". A handsome brochure featuring ALA's history and its current membership benefits was part of that drive (shown above). 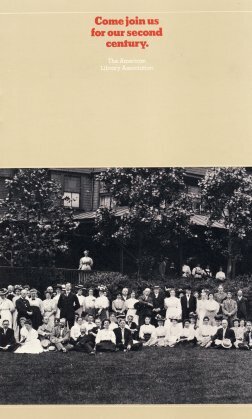 The cover of the brochure has a picture (continuing on the back of the brochure) of the attendees at the 1907 ALA Annual Conference in Asheville, North Carolina. I particularly remember the ALA100 coffee mug, a beautiful mug that I believe was only sold at that conference. I used that mug every day for coffee at work for three decades, and it's still a beautiful mug. I chaired the "Fain in the Park" and remember it rained heavily and was nearly cancelled. Pat Harris worked hard on this one. So glad it is remembered.